OXXO in Frisco and Plano are among the dry cleaners in North Texas that use GreenEarth, an eco-friendly dry cleaning solvent. Photos courtesy of OXXO. Thanks to the green cleaning movement, North Texans can now find a variety of eco-friendly laundry detergents in local stores. But did you know that DFW is home several eco-friendly dry cleaning businesses as well? OXXO Care Cleaners is a dry cleaners with locations in Frisco and Plano that touts its eco-conscious methods. The company’s primary green selling point is it uses GreenEarth, a gentle cleansing solvent, designed to care for garments but not endanger the environment, your clothes or you. Translation: no harsh chemicals and no harsh odors. Cutting edge technology at the Plano location. The dry cleaning company was founded in Hollywood, Florida in 2000 by Salomon Mishaan, who grew up in Colombia before coming to the United States. Today, there are 50 locations in the U.S., including the two local franchises in DFW. Locally, OXXO Care Cleaners opened in Frisco in 2009 and then in Plano in 2015. The GreenEarth Cleaning process uses liquid silicone in place of petrochemicals Cereijo explained. In short, that means the GreenEarth product is so safe that if you wanted to, you could rub it safely on your skin. In fact, you probably already do according to Cereijo. So now that you know what is used in the GreenEarth, you might be asking what has been cut out? That would be perchloroethylene, certainly a word you won’t hear uttered at OXXO Cleaners. The chemical solvent typically used in dry cleaning has been shown to have health risks, according to the EPA. GreenEarth has also been endorsed by numerous dry cleaners around the country, but Cereijo said OXXO is the only cleaner that combines GreenEarth cleaning, with hand ironing on premises and a 24-hour ATM style pick up and drop off system. This is accomplished by creating an online account. The company’s retrieval system is automated, allowing customers to pick up their clothes any time of the day, any day of the week. 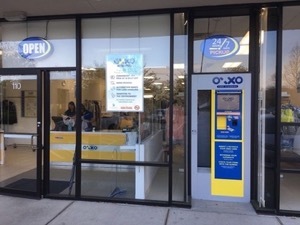 A kiosk near the OXXO entrance allows 24-hour drop-off and pick up service. Cereijo says her company also strives to keep the business eco-friendly in other ways like using bags that are biodegradable and designed to disintegrate within two years. Hangers are recycled. In addition, all of OXXO’s equipment is electric, so there is no need for industrial steam, and the temperature is kept at a cool 72 degrees. This removes the “sweatshop” atmosphere of most cleaners, according to the company’s website. “Because we do not use a boiler room, we use less energy,” Cereijo added. 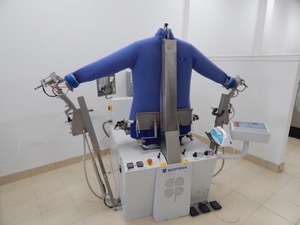 This year, the OXXO Care Cleaners franchise also plans to open its first fully automated unmanned dry-cleaning facility allowing customers to drop off and pick up cleaning and laundry 24/7 with no attendant. “OXXO Care Cleaners offers not only great quality service for our customers, but also environmental friendliness and a great and safe work atmosphere for our employees,” Cereijo said.